I've always been a bit skeptical about full-album concerts, but I wasn't about to miss a chance to see Fehlfarben, one of the undisputed best bands to come out of the German punk and Neue Deutsche Welle scenes. 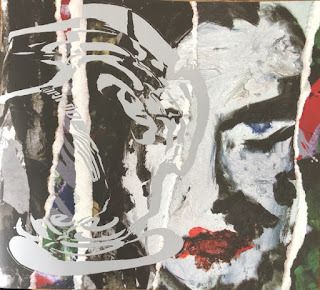 One of the very first reviews I ever wrote for this blog was of their iconic debut album, Monarchie und Alltag, the very album they were performing in full. (According to my webhost's statistics, it's the most popular review I've ever published.) Furthermore, just before I caught wind of this concert, I wrote an entire article about "Militürk", one of the songs from the same album. To say the least, I was excited for this concert. Not knowing anything about Black Heino, while doing my advance research, I quickly realized their name was appropriative. (You'll have to forgive me for being previously unaware of the Schlager singer Heino, who is white, just like the members of Black Heino.) I've been unable to find any explanation from the band other than provocation, which is a tired excuse. Despite my reservations, I tried to give them a chance on the merit of their music, but they failed to impress me on that account as well. They were boring, repetitive, and simplistic. Most of their solos and lead melodies were literally just ascending and descending a scale. At first, there were a few little flairs that reminded me of classic 60s pop/rock and garage rock, but even those gradually disappeared. The vocals were whiny and shouted tunelessly in the style of Frank Jürgen Krüger (of Ideal) and other German punks. (Why that style is beloved is beyond my understanding.) Their lyrics might have been good, but I couldn't tell, and I wasn't inspired to look them up. After that disappointment, I was impatient for Fehlfarben. Thankfully they didn't keep me waiting too long, and they launched right into "Hier und jetzt", the opener from Monarchie und Alltag. As expected, they played the whole thing start to finish, and then they left the stage. They came right back out for a second set consisting of much more recent compositions, and for the encore, they offered more of the same plus their first single, "Große Liebe". As a result of the format, it seemed as if I saw two different bands with the same members. The first set was dynamic, varied, engrossing, and exciting despite the age of the songs. There was an unavoidable hint of gimmickry due to the premise, but the songs were still strong and largely relevant, and the audience was into it. The second set and encore were subdued, monotonic, and relatively tame. The band was still trying, but the audience wasn't feeling it, and people steadily streamed out while they were playing. The newer songs aren't bad at all, and lyrically they still have plenty to say, but somehow it didn't translate well on stage. The songs blended into one another and I had trouble concentrating and understanding the words. Although the second half of the show wasn't as good as I had hoped, the first part didn't disappoint. It was awesome to see the entirety of one of my favorite albums played live by most of the original band. Peter Hein, the original vocalist who left after the debut album to work at Xerox for twenty years, has been back in the band ever since they reformed. He danced around stage, playfully messed around with the other members while they performed, tossed around balloons, and joked about whatever was on his mind. His vocals were actually substantially more powerful than they were on the album (although still not exactly trained or proficient by mainstream pop standards). As a result, he changed the original melodies and cadences at will, which was sometimes annoying but often a welcome improvement. Three other original members were also present: bassist Michael Kemner, saxophonist/percussionist/keyboardist Frank Fenstermacher, and synthesist Kurt Dahlke, aka Pyrolator (although he only played on "Paul ist tot" on the album). 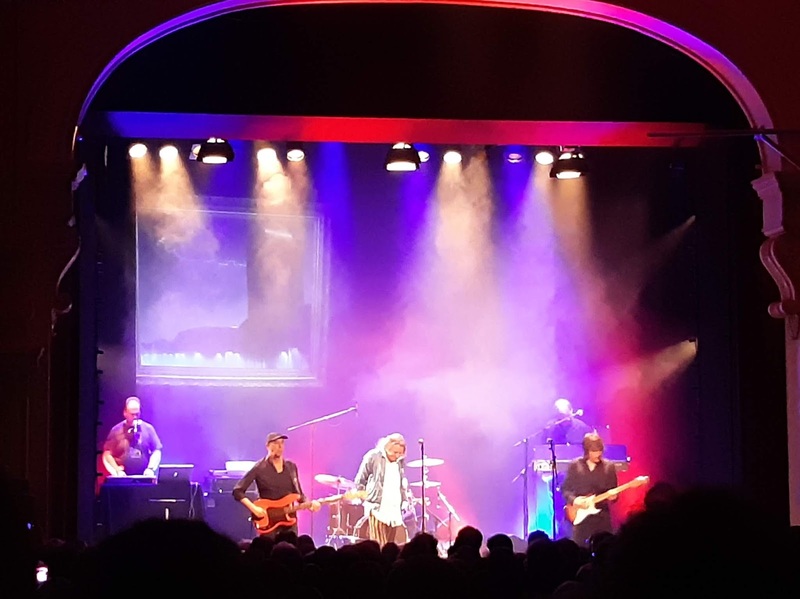 Unfortunately, drummer Uwe Bauer hasn't played regularly with the band since 1991 and original guitarist Thomas Schwebel left the band around 2006. (The post-Hein additional guitarist Uwe Jahnke also left in 2014.) In their places were longtime drummer Saskia von Klitzing and relative newcomer Thomas Schneider on guitar. They were both capable replacements that played the original parts with deft skill. Other than Hein's vocal alterations, most of the songs were played very similarly to the original versions. The exceptions were the three most beloved songs: "Militürk", "Ein Jahr", and "Paul ist tot". "Militürk" was extended and just as extreme as ever. It's admittedly quite strange to hear the crowd chant along to "Deutschland, Deutschland, alles ist vorbei" ("Germany, Germany, it's all over"). How do I interpret the remark from one of the elder punks in front of me to his comrade that the lyric suited the present day just as well? "Ein Jahr" was also somewhat extended and rearranged, starting with the drums and then bass instead of the distinctive guitar riff. As if designed to prove the allegations of the band being a one-hit wonder, the audience response was conspicuously drastically more enthusaistic. The entire crowd tried to dance or sway to the mock-disco beat, and the sound of their singalong was louder than Hein. Something about it felt forced. Perhaps the band's claim that they never liked the song was true. The performance didn't quite live up to the studio version. The album closer "Paul ist tot" was the other highlight. It wasn't until recently that I finally began to understand the song; until then, I'd never been able to figure out why German fans would often cite that as one of their favorites. Again, the audience sang along with the despondent lyrics, even when Hein forgot a line. The band extended the song about as far as it could go, and they made it work. Hein wandered off stage after he finished his part, but most of the band kept going. Von Klitzing eventually left too, but since the rest of the band kept going, she came back and drove them to a finish. Even then, Schneider kept hammering away at his guitar until he too grew tired. I was a bit disappointed that Fehlfarben didn't play anything from the other albums released during their initial incarnation in the early 80s. 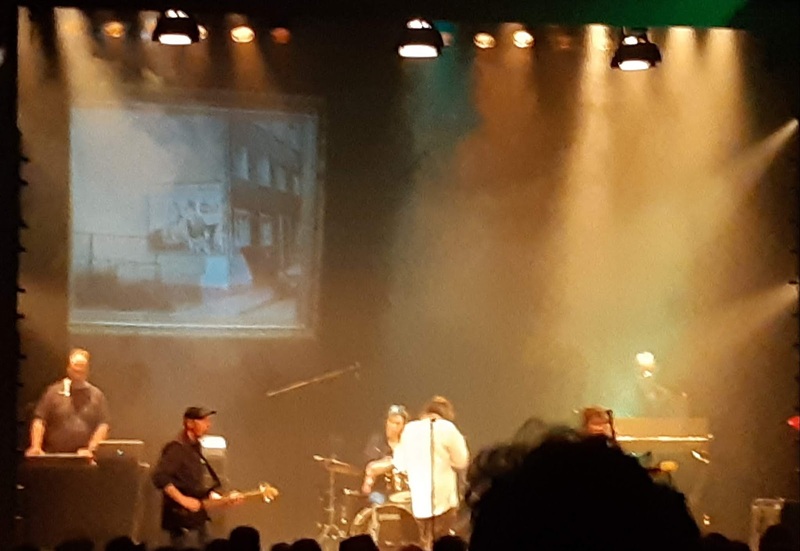 However, of the musicians on stage, only Kemner played on 33 Tage in Ketten (1981) and none of them played on Glut und Asche (1983)! That said, they did play "Große Liebe", their first single that preceded even Monarchie und Alltag in 1980. It was originally recorded by S.Y.P.H. under the title "Industriemädchen" and presumably brought to Fehlfarben by Schwebel, who was an original member of both bands and wrote the lyrics to it. The industrial love song was just as ironic and appropriate as ever. It brought the show to an end on a (relatively) high note. The concert gave me a wild assortment of conflicting feelings. The original album is a classic, and the band can still do a solid rendition of it. However, there was still a lingering feeling of being pandered to. I liked that the band adapted and extended some of the songs from the album, but "Ein Jahr" didn't quite work, and it took a few songs for the mix to sound right. Hein's vocals were an interesting change, but he forgot some of the lyrics and took a playful, uncommitted stance. And after they finished the album, the rest of the show just couldn't live up to it. The words are perhaps the most important part, but they were often indiscernible. The band is still relevant, but they are aging and their energy seemed to wane. The audience followed suit – or maybe it was the other way around. It was a weird show, especially since they played basically the same show last year. It's hard to blame them, since this show was sold out, but the artistic merit is questionable. 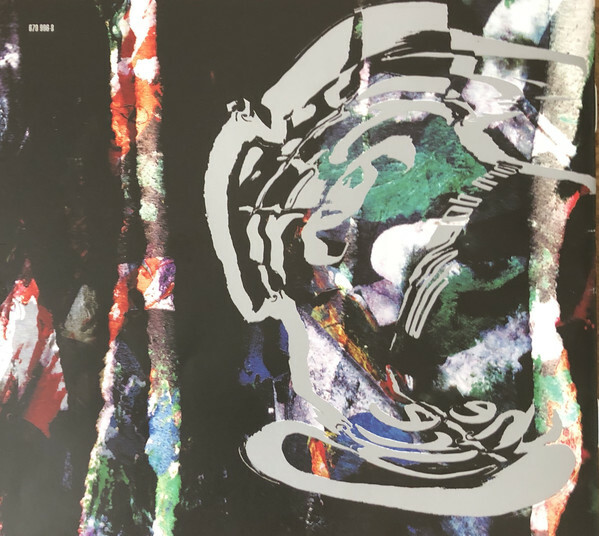 For better or worse, Fehlfarben fell in the trap of having released an album that captured the voice and spirit of a particular generation in a particular time and place. Judging by the sales numbers and the audience reaction, nothing else they do can quite reproduce that magic, no matter how hard they try. P.S. The only other review I've found so far of the show (in German, of course) is from the Berliner Morgenpost. It's a bit harsh but not far off from what I observed. P.P.S. The Berliner Zeitung has a review of last year's show (again in German) that also has some elements in common, although it says very little about the actual performance. Leo Grande played the first night of their German tour in their hometown at the cozy Prachtwerk. Antonio Hoffman led the group with acoustic guitar and vocals, preferring a folky fingerpicking style over anything heavy. His vocals were stronger than I was expecting, although his annunciation was casual and loose such that I didn't quite catch every word. 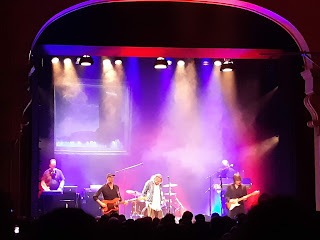 The lyrics were in German, and from what I could I understand, they were personal but amusing and often focused on social connection and understanding. Their looming cover of Ton Stein Scherben's "Mein Name ist Mensch" ("My Name Is Human") fit right into their themes. However, Leo Grande was far more than just a singer/singwriter with a backing band. The interplay of all four musicians was what made their performance successful. Jonathan Kirchgeßner played keyboards that sometimes kept to the shadows but often swelled with drama. His tones set the mood of their songs towards darkness or light. Raffael Bernhardt supplied superb harmonies while holding down an upright bass. His variety of techniques meant that the bass was more than just filler for the low end. Andrea Zuliani also offered a mix of styles and rhythms with his drumset that kept the pace from being monotonous. Their style was jazzy, but not just because of the upright bass and the brushes on the drums. It was more about how the musicians worked together to construct a cohesive and compelling sound without getting lost in pretentious complexity or pandering with simplistic clichés. Their sense of balance was essential: Antonio took a few brief solos, but for the most part, they played off each other and just let the instrumentals build up together. That feeling of collaboration was what made them special. No one member was the star: they all had something to contribute. 09. Why Do I Go? The show opened with singer/singwriter/guitarist Antoine Villoutreix, accompanied by Karsten Lipp on lead guitar. Antoine's songs appear deceptively simple, but his lyrics are subtle, clever, and humorous if you listen closely. To be fair, I can only speak for the parts in German and English; he also sings plenty in his native French that is opaque to me. But even when I couldn't understand the words, his gift for melody and catchy songwriting craft carried the songs just fine. Lipp's guitarwork was an excellent addition as well. He played just the right parts to underpin the songs without overwhelming them, and he filled the instrumental breaks with proficient solos. Ian Fisher appeared with a complete band: Ryan Thomas Carpenter on keyboards, guitar, and backing vocals; Andreas Laudwein on bass and backing vocals; Ollie Samland on pedal steel; and Camillo Jenny on drums. They started out by playing several songs from the new album, Idle Hands. The title track was a strong opener. The smart lyrics were only reinforced by an extra edge in the live performance. "Tables Turn" marks a turning point in songwriting and arrangement for Ian, showcasing his ability to stretch into classic pop and simultaneously push forward. "Road to Jordan" followed suit. "Icarus" and "My Eyes Have Seen the Glory" are conspicuously slower and sparser, but show growth in being able to make the minimalism work with getting tiresome. After playing about half the new album, everyone left except for Ian and Ryan. They played three songs from the 2013 album Ian Fisher & the Present, which also featured just the two of them. It was a delightful throwback. Ryan switched to guitar and they shared a mic. Their guitars and voices still blend just as sublimely as they did five years ago. There is still a special place in my heart for Ian's acoustic folk, even if I also enjoy his growth and development with a full band into a wider array of styles. I also liked that Ian slightly changed the arrangement of the old songs by playing a 12-string guitar. Ollie returned to the stage for "Nero", the opening track of Ian's album of the same name from 2015. It was a slow build that demonstrated the dynamic power of Ian's voice. For "All Ya Need", Ryan stepped off but Andreas and Camillo returned. Ryan rejoined to complete the full band for a rousing take on "Koffer". 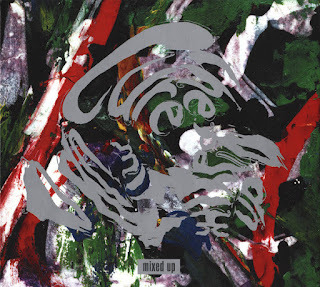 The arrangement was somewhere between the tightly produced, almost electro-sounding studio recording and the original acoustic demo (both of which, incidentally, appear on Koffer from 2016). The band also gave us a strong rendition of Ian's signature song "Candles for Elvis", dedicating it in protest to Donald Trump. Again, they played a new arrangement that was slightly different than any of the three studio versions Ian has released over the years. Ian and the band then proceeded to complete their performance of Idle Hands. "Long Line" and "Bed Downtown" were both already strong on the album, but live they had even more energy. "Bed Downtown" in particular shone, giving extra time to contemplate the moral ambiguity with a bit of a noisy jam at the end. I think it was Ollie's pedal steel that was given a chance to wield some effects and get weird. For "Tears in Dust", everyone left but Ian and Ryan, who played a synthesized string part to match the arrangement on the record. It was a beautiful way to finish. Ian Fisher's latest step into stately, carefully crafted, Americana-inflected pop turned out quite successfully, and the transition to the stage went off without a hitch. His humor was on display as well, and the interplay with Ryan and the rest of the band was fun. The extensive use of 12-string guitar along with the other subtle changes to the old songs meant there were plenty of extra touches to keep things interesting. Ian continues to impress me no matter what direction he takes. P.S. 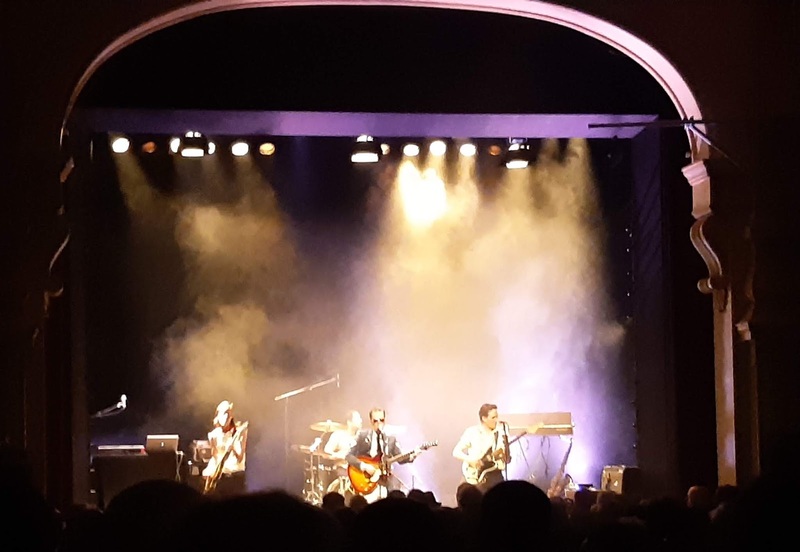 If you want to catch a taste of the live band (albeit without Ryan), check out their set recorded just a few days ago for Radio Zwei in Bremen. P.P.S. Thanks to Alyssa, Laurent, and Eva! Sound of Ceres opened the show and immediately got weird. Their four members remained mostly motionless behind their instruments and produced an ethereal, mostly synthesized, heavily effected haze that drew strongly on Cocteau Twins and the night's headliners. The music was warm and pleasant, but not particularly captivating. The main attraction was their light show. They used a set of focused lights to generate figures of light on the center of the stage. With each song, the patterns changed and developed. The singer increasingly interacted with the lights as well and frequently played as if she were summoning the figures herself. While most of the stage was shrouded in darkness, they used fog machines, bright spotlights directed at wispy garments, and flashlights rhythmically pointed across the venue. The weirdest element was that between some songs, two of the members enacted dramatic readings with some sound effects. The words didn't make much sense and the theatrics came off as rather cheesy and overly earnest. I didn't get the point. I'll take Golden Dawn Arkestra's focused messages of love and environmentalism any day, but this lacked clarity and intention. 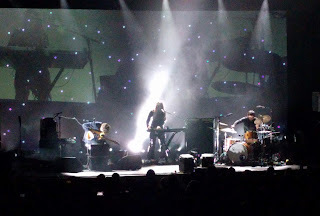 Beach House also relied on an unusual light display, although it was different than what they used on their last tour. They kept the stage mostly dark, but used spotlights to periodically light the band from behind or at oblique angles. The video screen behind them occasionally showed psychedelic patterns similar to the album artwork of their latest album, 7, and their recent music videos. During a few of the songs, the screens even showed the band members. However, the cameras were pointed at their instruments and their hands without showing their complete bodies. The band appeared as a three-piece: the two core members and drummer James Barone. Unlike the last tour, there was no bassist or additional keyboardist. Instead, there was a conspicuous use of more samples and prerecorded backing tracks. It was rarely distracting or detracting, and they've always used drum machines and some backing tracks, but it did occasionally contribute to a sense of rigidity and stiffness. On record, Beach House presumably spend a great deal of time and focus on sounding large and dense. Their arrangements are rarely especially complex, yet they are mixed to sound full and thick without being overly compressed. It's an impressive feat that contributes to why I like them so much. On stage, they presumably try to reproduce that effect, but it's harder to do so as effectively. I've complained before that sometimes it sounds like something was missing in some of their live performances, and this time it was only exacerbated by the lack of a fourth performer. This was most noticeable at the start, when something seemed wrong with the mix. In particular, Alex Scally's guitar was too quiet. The setlist demonstrated their standard practice of mixing old and new songs rather unpredictably, although there was still some overlap with the two shows I'd seen before. They don't have a bad song in their catalog, and they played several of my favorites alongside seven new songs. While it's hard to complain about that, I was hoping we might get something from the B-Sides and Rarities compilation released last year or some of the more obscure songs from their first two albums. I was also surprised that they didn't play anything from their previous album, Thank Your Lucky Stars (2015). 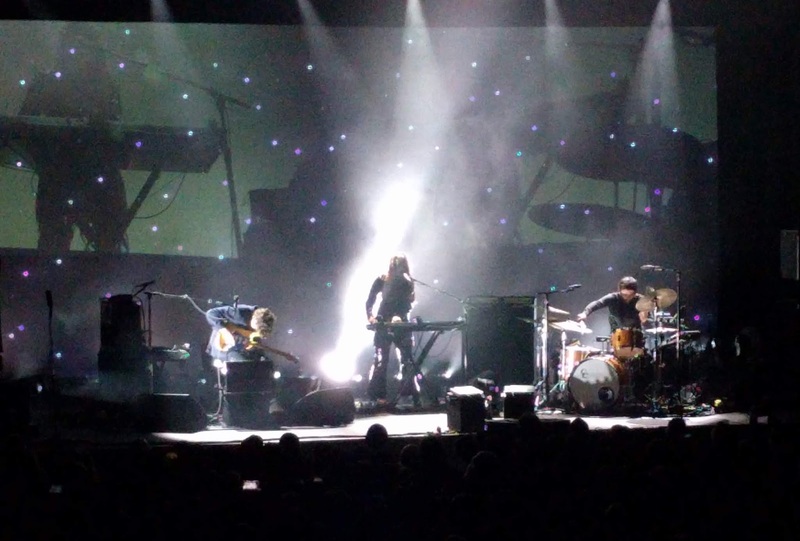 By and large, despite some minor complaints, Beach House still came across as powerful and enveloping. Their songs are often on the long side and yet they never get boring or tired. While some of the renditions felt slightly different than on record, that wasn't necessarily a bad thing. Some songs just had a different energy to them, and "10 Mile Stereo" and "Dive" ended with extended, noisy jams. Even if there were some occasional lapses in their wall of sound, it was easy to just get lost in the field and enjoy the experience.